So you know how I spent yesterday banging on about how I don’t have any immediate publication plans, on account of nothing being polished enough for human consumption? 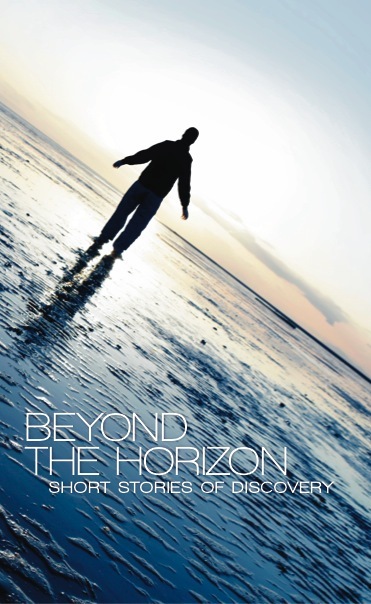 Well, last night I got an email saying a book I submitted a short story to, Beyond the Horizon, has now been printed and can be purchased from Amazon by discerning readers as of NOW. Well, Monday past actually. Sorry if that was misleading in any way, but in my defense short stories take a bit less re-writing than novels. I got involved with the book when a friend of a friend from university saw me banging on about 12 books in 12 months on Facebook and sent me a message asking if I had time to submit a story. “Going under name ‘Bamboccioni Books’, we are a team of recent graduates who have interned at various UK publishers, but are currently struggling to break into the industry due to a shortage of jobs and the high number of applicants for the few junior positions. We have decided to try our hand at small scale publishing, and selected Lightning Source as it allows you to sell books through Amazon and other online stores, and keep your own imprint. I duly penned The Strange Tale of Merlin Pugh, ummed and ah’ed over whether it was a bit too much like the first chapter of a novel (book writing, as discussed, is quite different to short story writing) and sent it off to the Bamboccioni team, who evidently liked it enough to use it. I re-read it again the other day and there are all sorts of minor things I’d probably change now, but that’s always the way when you go back to something. Hopefully it can hold its own against Meaghan Delahunt and the rest of the authors involved! As a teenager I had a few poems published in those anthology things they advertise through schools, where the teacher makes everyone in the class submit something and your parents are then obliged to buy several copies for various aging relatives; but I think this is my first ‘proper’ fiction publication. And the fact it has an ISBN number (978-0-9568717-0-1) actually makes me eligible for a lot more fiction writing competitions – the BBC National Short Story Award, for example, won’t accept submissions from people whose work is predominantly online, even if it’s a reputable site and you were paid for it. So there’s nice. I haven’t got my copy yet but should hopefully get it next week, at which point I’ll be able to tell you all a little bit more about it. But even without seeing the thing I’m pretty sure from the author biographies on the Bamboccioni website that there will be lots of good things in there, and you will get value for money. I’m not saying you have to buy it, just that everybody else will, and your life will probably feel a little bit empty without it.